Roman style artichokes is a traditional Roman dish. 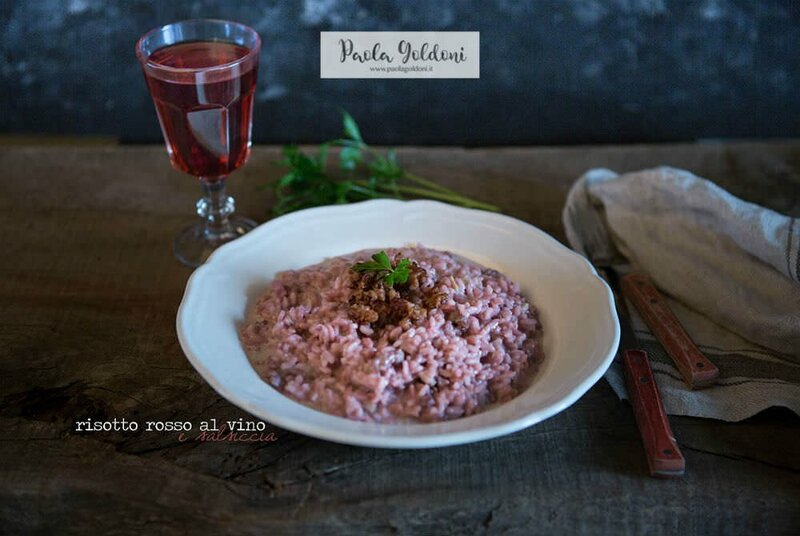 More precisely it’s a tasty side dish, usually served with meats, especially lamb. In many Italian restaurants Roman style artichokes are even served as an appetizer. 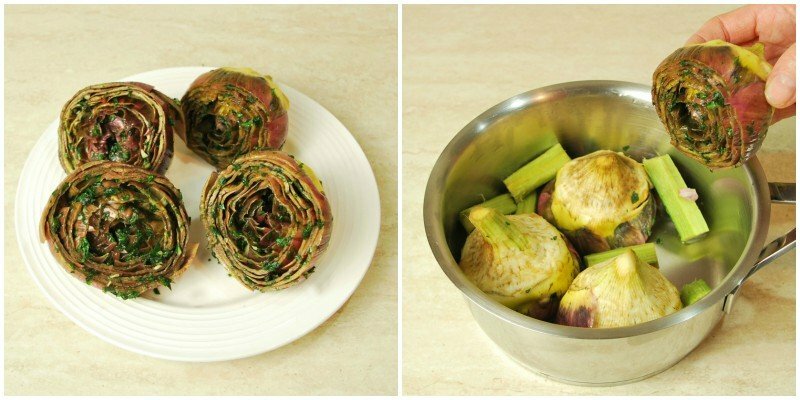 The variety of artichokes needed for this recipe are roman artichokes or mammole, that stands out from the others for its rounder shape and non-thorny leaves. These are called globe artichokes in English. Then there is the mint (or better still mentuccia, a type of wild mint with a flavor resembling a cross between mint and oregano), parsley and the garlic clove to spice up the inside. 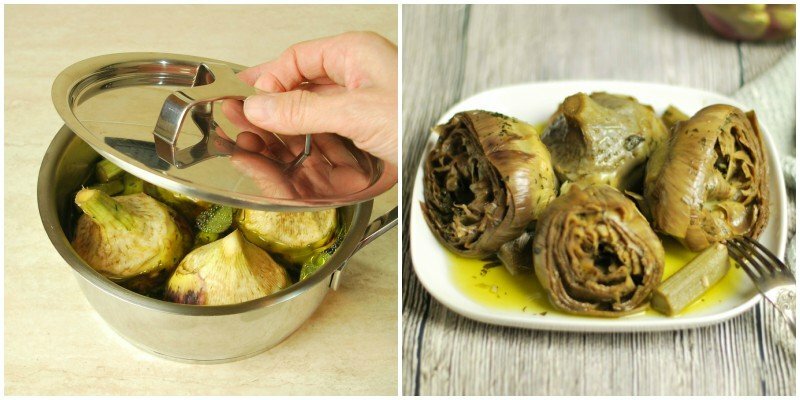 The preparation of this exquisite recipe is rather simple; Roman style artichokes are cooked in a pot with a high edge, close to one another, so that the leaves do not open during cooking. After having properly cleaned from the hardest leaves, season them with aromatic herbs, enlarging the leaves and inserting the minced mint, parsley and garlic. 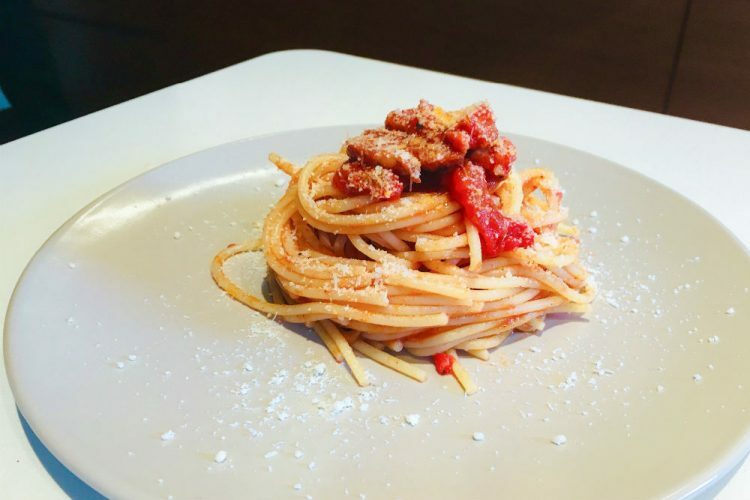 Finally, arrange them in a pot upside down and cook for about half an hour. 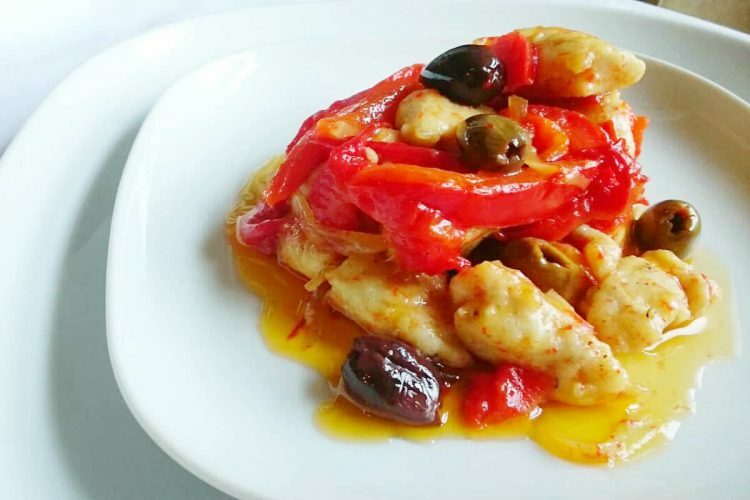 A slow cooking is necessary to turn this hard-skinned flowers into a delicious, soft and fragrant side dish. 1) First of all, make the mixture of herbs and garlic that will flavor the Roman-style artichokes. 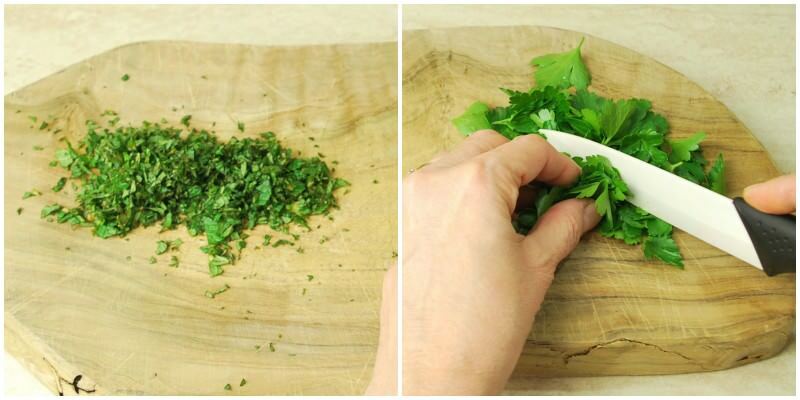 So, finely chop mint and parsley and place them in a separate bowl. 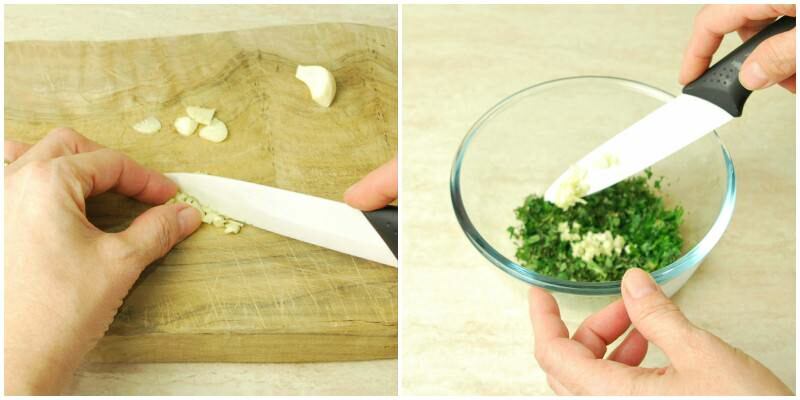 2) Then chop the garlic and add it to the chopped mint and parsley. 3) Now add a pinch of salt and 2 tablespoons of extra virgin olive oil. Finally mix all the ingredients then leave the mixture aside. 4) Done that, start cleaning the artichokes. But first of all, take a lemon and cut it in half. Then fill a bowl with a little cold water and squeeze in one half. 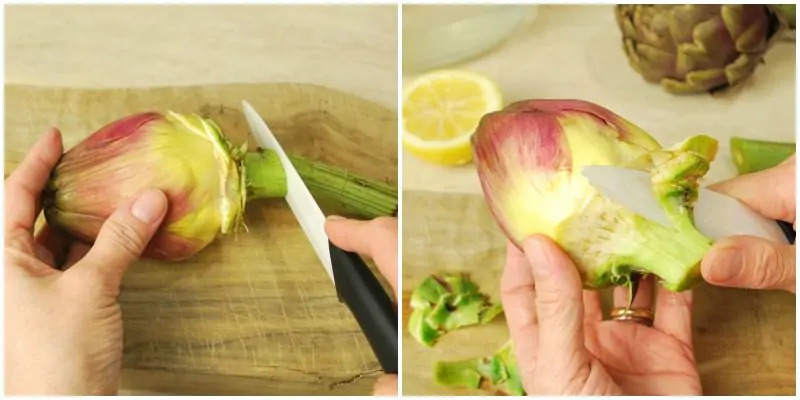 With the remaining half rub your hands; in this way they will not be blackened during the cleaning of the artichokes (or you can use disposable rubber gloves). Now take the artichokes and start removing the most external and hardest leaves. 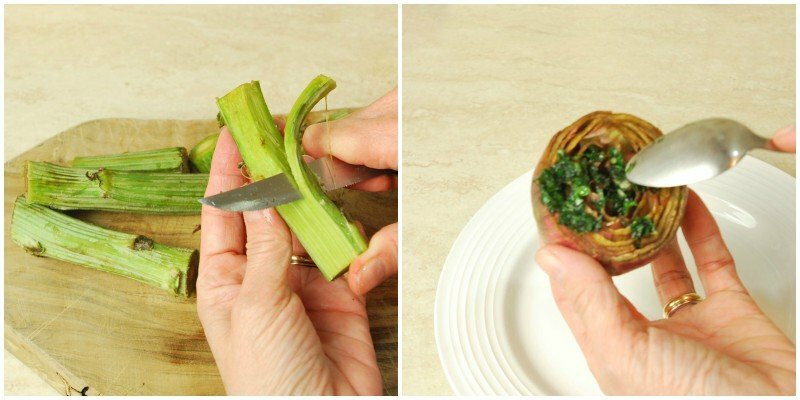 5) Cut the stem, leaving only a small piece, then, with a little sharp knife, remove the hard dark green leaf remnants around the base which are quite woody. 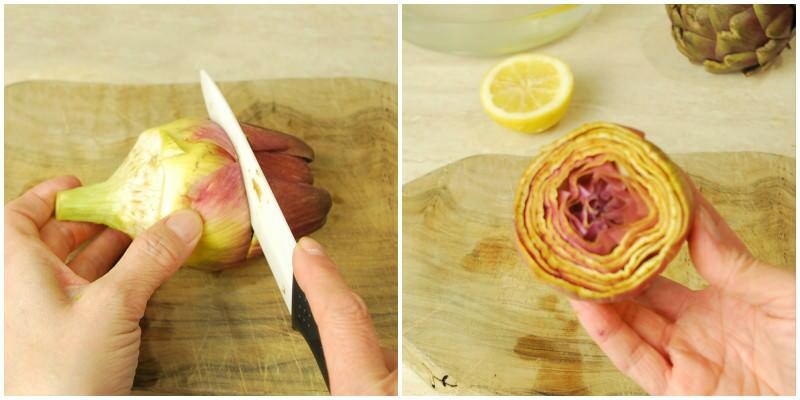 6) Cut off the top, about 2″ of the artichoke. Leave behind only yellow leaves. The “choke” of the artichoke is that bundle of silky yellow and purple leaves you see in the middle. 7) Below those leaves is a bed of hairy-looking filaments. 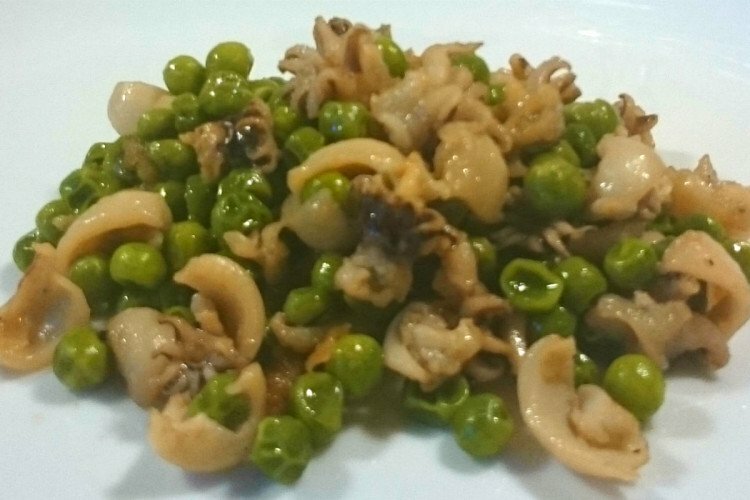 You want to remove them entirely using a small sharp knife because they are not edible. 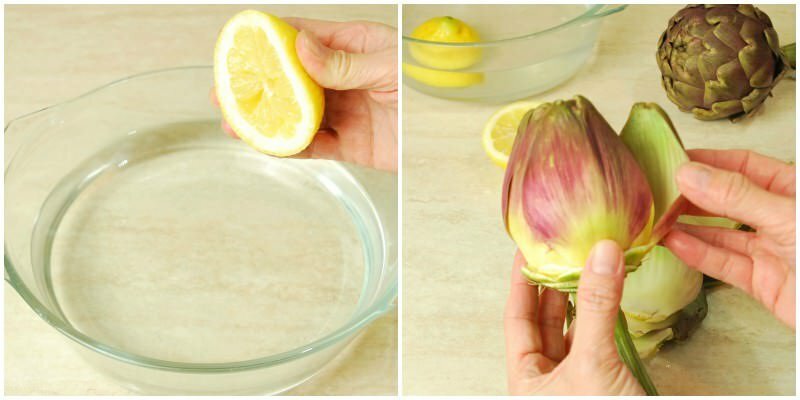 When the artichokes are ready, put them in the bowl with water and lemon, so that they don’t darken and can keep their bright colors. 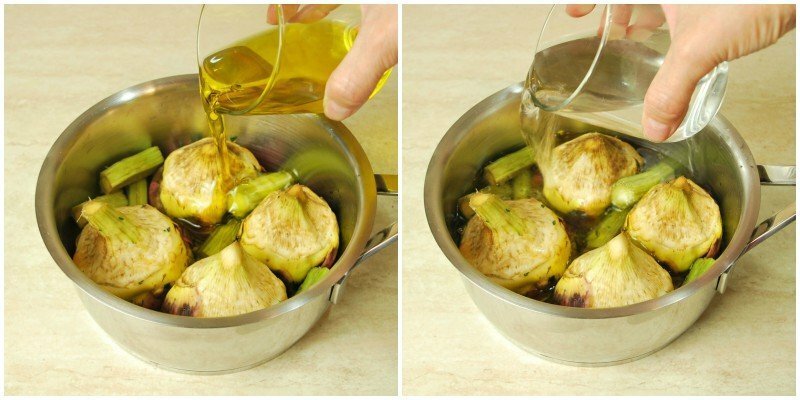 8) Now take the stems and peel them (cooked they are delicious), then start to stuff the artichokes, spreading well their leaves, with the mixture of herbs and garlic. 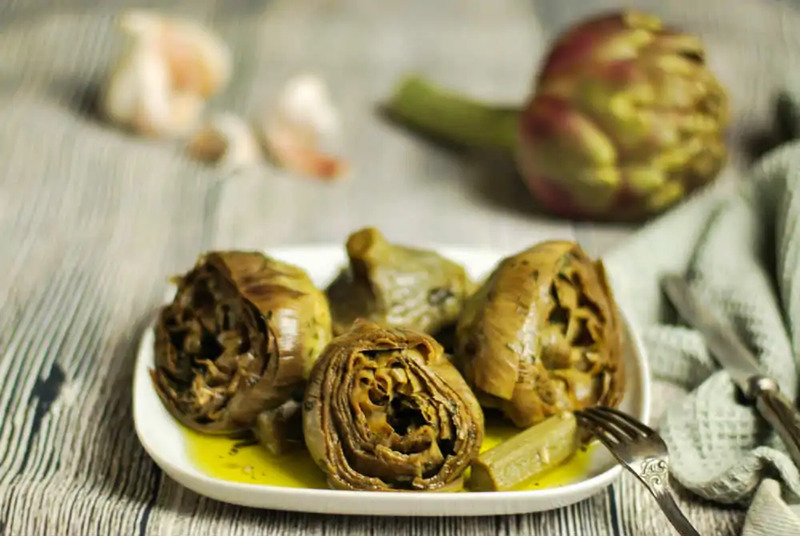 9) Once ready, take a small pot with fairly high edges and place the artichokes upside down, very close to each other, so that they do not open during cooking. Then add the stems. 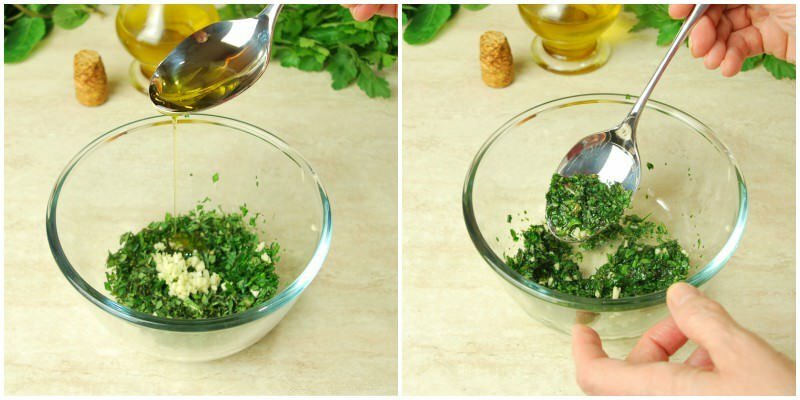 10) At this point, add 10 tablespoons of extra virgin olive oil and half a glass of water. 11) Cover with a lid and cook for about 25 minutes. 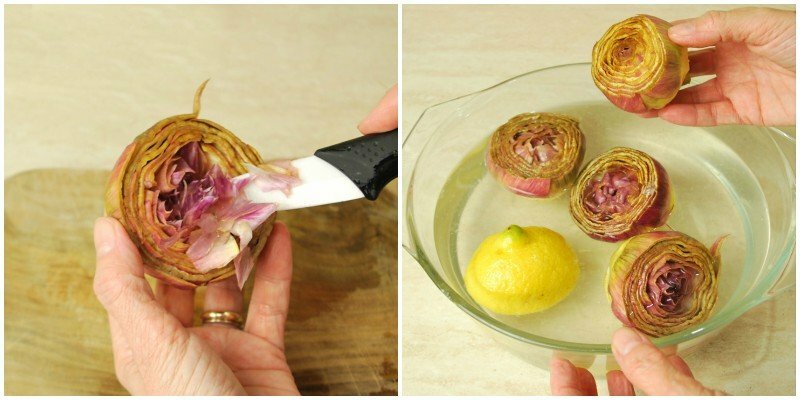 When they are tender, place Roman style artichokes in a plate and serve hot. 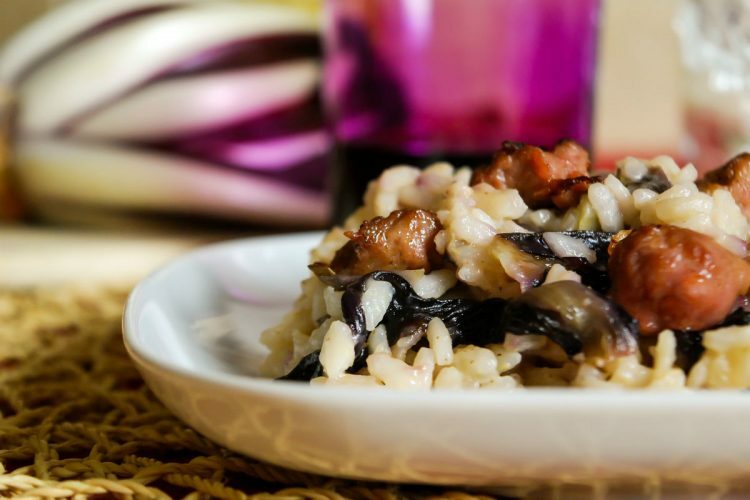 No Replies to "Roman Style Artichokes | Carciofi alla Romana"